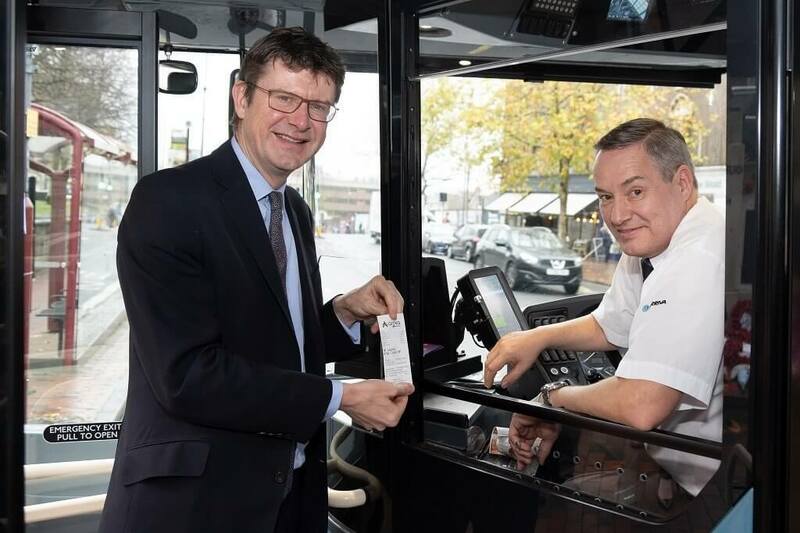 Arriva was joined by Greg Clark MP last week to launch contactless ticketing on its fleet of buses in Tunbridge Wells. The launch event, where the very first ticket paid for with the new contactless technology was issued to Greg Clark, was held outside Tunbridge Wells Town Hall on 16 November. As of Sunday 18 November, all Arriva passengers in Tunbridge Wells, Tonbridge and Sevenoaks will be able to buy their own tickets using contactless payments. Debit and credit cards can be used to purchase tickets on the machines – which were supplied by Ticketer – as well as Apple and Android Pay. Greg Clark, Secretary of State for Business, Energy and Industrial Strategy, said: “I am delighted that Tunbridge Wells will have contactless payments on buses. “Making bus travel more convenient for passengers is really important, so it’s great that Arriva is introducing contactless ticketing in its vehicles. The system is available on all Arriva buses within the Tunbridge Wells, Tonbridge and Sevenoaks areas, with the exception of some of the route 7s and 6s that come from the Maidstone depot. Oliver Monahan, Area Managing Director for Arriva Kent and Surrey, added: “After the success of our contactless payment trial at Guildford depot, we decided to bring the service to West Kent, as a step forward in opening up bus travel to those who do not often carry cash. “The move will create a faster, easier and more convenient way to pay for our customers, which in turn will help to speed up boarding time and improve the customer experience.